Did you know that about 50 percent of all antibiotics in U.S. outpatient settings are prescribed incorrectly (the wrong antibiotic, at the wrong dose, for the wrong length of time, or at the wrong time)? This statistic was startling to me, especially as a patient and a mom. I have had frequent sinus infections since I was in my teens, and I can honestly say that I was misinformed about antibiotic use until my early 40s. I can remember going to the doctor with a terrible cold and being prescribed antibiotics at the drop of a hat. When I got really sick last June, I ended up in the hospital. The doctors were pumping me full of three different IV antibiotics to rid my body of the infection, and then when I was released from the hospital they prescribed two additional antibiotics. Apparently, the germs in my body were resistant to the antibiotics that they originally gave me in the hospital, so they had to modify my treatment accordingly. Because of that, I want to help others be knowledgeable about when and if there is a need for antibiotics. 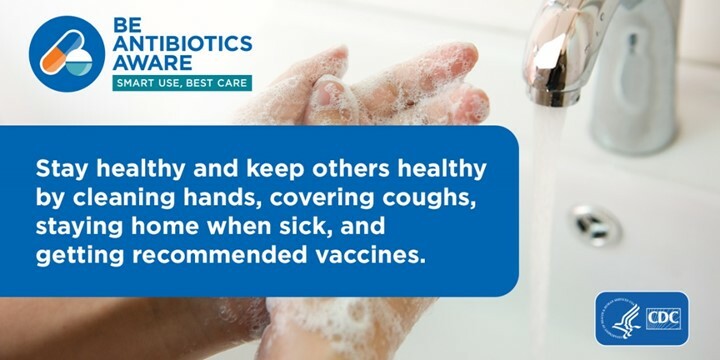 Here are some tips all parents should know when it comes to appropriate antibiotic use (for you and your family’s health). Antibiotics do not work on viruses that cause colds and flu, bronchitis, or runny noses, even if the mucus is thick, yellow or green. Antibiotics are only needed for treating certain infections caused by bacteria. Antibiotics aren’t needed for some common infections caused by bacteria, including many sinus infections and some ear infections. When antibiotics aren’t needed, they won’t help you, and the side effects could still hurt you. Side effects range from minor to very severe health problems, like a rash or Clostridioides difficile infection (also called C. difficile or C. diff). When you need antibiotics for an infection, the benefits of the drug usually outweigh the risk of side effects. If you need antibiotics, take them exactly as prescribed. Talk with your doctor if you have any questions about your antibiotics or if you develop any side effects. Antibiotic resistance is one of the most urgent threats to the public’s health. When bacteria become resistant, antibiotics cannot fight them, and the bacteria multiply. Some resistant bacteria can be harder to treat and can spread to other people. Antibiotic resistance does not mean the body is becoming resistant to antibiotics; it means that bacteria develop the ability to defeat the antibiotics designed to kill them. Each year in the United States, at least 2 million people get infected with antibiotic-resistant bacteria. At least 23,000 people die as a result. Any time antibiotics are used, they can cause side effects and lead to antibiotic resistance. Antibiotics save lives. They are critical tools for treating people with serious conditions like pneumonia and sepsis, the body’s extreme response to an infection. However, antibiotics aren’t always the answer. When you’re sick, remember that an antibiotic will not make you feel better if you have a virus. Respiratory viruses usually go away in a week or two without treatment. Ask your healthcare professional about the best way to feel better while your body fights off the virus. If you get sick, follow these examples of ways to relieve symptoms of infections caused by viruses. Use saline nasal spray or drops. Breathe in steam from a bowl of hot water or a shower. Stay healthy and keep others healthy by cleaning hands, covering coughs, staying home when sick, and getting recommended vaccines—for the flu, for example.